In order to get the most bang for your SEO buck, you need to know who your target audience is, so that you can advertise with the right search engines and use the right keywords on your Web site. When you know who’s looking for you, this helps you choose where best to advertise. For example, if you’re selling dog sweaters, it’s probably not a great idea to advertise in biker bars. Sure, there might be a few Billy Bob Skullcrushers with a cute little Chihuahua in need of a cashmere shrug, but statistically, your ad would probably do much better in a beauty salon. The same goes for your Web site in a search engine. Gender, age, and income are just a few of the metrics that you’ll want to track in terms of identifying your audience. Search engine users are pretty evenly split between males and females, with a few slight differences: 50.2 percent of Yahoo! users are female, whereas 53.6 percent of Google users are male. In terms of age brackets, the older set leans more towards using Ask.com, and the younger users wind up on Yahoo! and MSN.com most often. In fact, Ask.com is changing their focus in order to cater specifically to married women. Google reaps the highest number of users with an income of $100,000 a year or more. You need to know who your search engine visitors are because this demographic data helps you effectively target your market. This demographic distribution is often associated with search query keywords, the words that search engine visitors use to search for your products. Basically your keywords are the words you used in your search query — or what you typed into the little search window. If you are searching for something like information on customizing classic cars, for example, you would type custom classic cars into the search field. 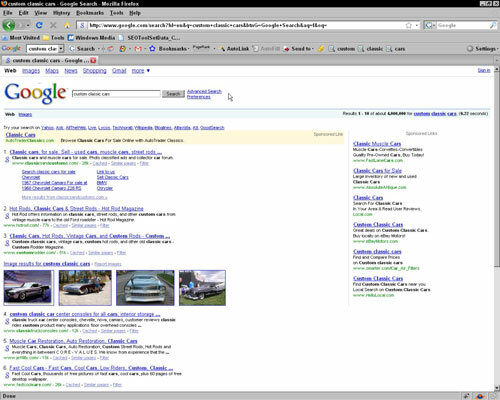 The following figure displays a typical SERP for the query custom classic cars. Keywords in a search engine window: custom classic cars. The search engine goes to work combing its index for Web pages containing these specific keywords and returns to you with the results. That way, if you have a product that’s geared towards a certain age bracket, or towards women more than men, you can tailor your keywords accordingly. It may seem inconsequential, but this is important if you want to be ranked well for targeted searches.